The system I am applying the filter to is a simple breadth system which uses the percent rank of the number of declining issues to generate a number between 0 and 100. When the number is greater than 80, it buys $SPY. To keep things simple, each trade has a time exit of 10 days. All buys and sells are made on the close of the day of the buy/sell signal. The annual return is low. If we test from 1.1.2002 – 9.30.2012 the annual return is 9.52%. The equity curve below shows when the system really started working. The system has performed well over the last decade. So that is the system. 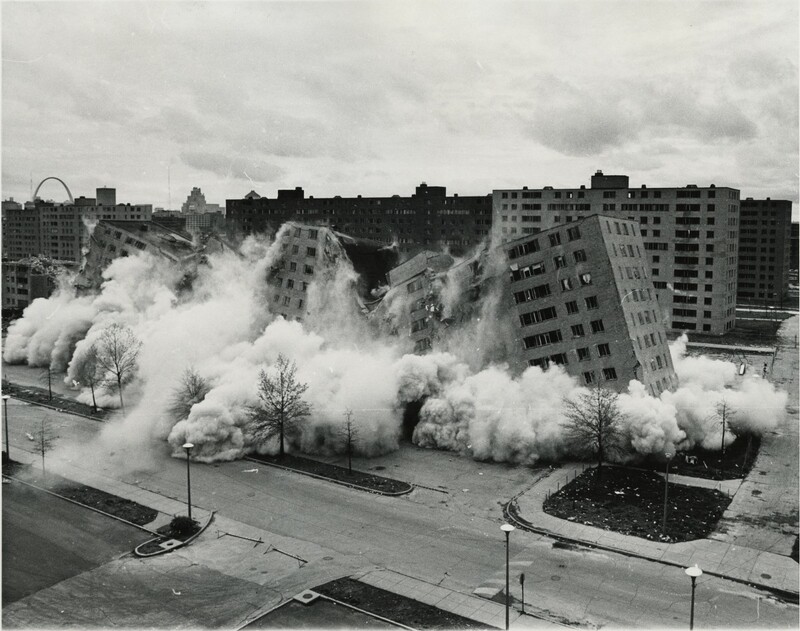 The question is, can waterfall trades be filtered out? 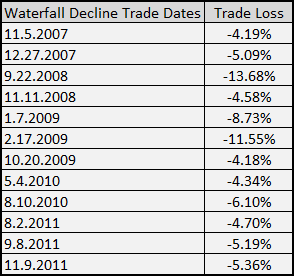 In order to answer that we need some dates for trades made during waterfall type declines. I am going to define all trades losing over 4% or more to be during a waterfall type decline. This is rather unscientific as some of these losses are during classic waterfall type events while others are not, but I needed a threshold and 4% is it. What we want to see after the filters are applied are that these trades are filtered out. 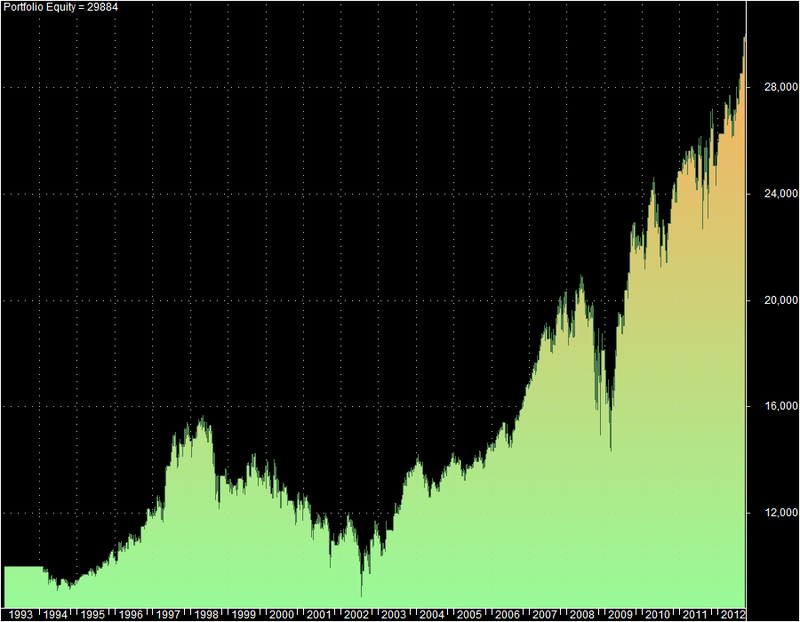 To avoid being overwhelmed by information, I’m going to start the system at 1.1.2007 and not consider all $SPY history. The list above is not a definitive list of large market pullbacks or corrections since 2007, only the dates of trades made by the system that lost 4% or more. 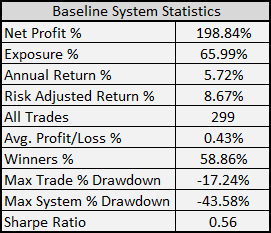 I want to emphasize that the system avoided some waterfall events simply because of the nature of the system. However, the system did catch some of the classic Armageddon trades during the 2008-2009 bear market, and they are easily visible in the equity curve. The next post will show the results of adding the first filter, which will be a lower Bollinger Band using a 50 day mean and a width of 2 standard deviations. I honestly have no idea if it will filter out some of the waterfall trades, but it is one of my favorite abnormal market type filters. I am 100% certain though that even if it does filter out some of the trades, overall performance will be worse. It goes along with some things I have tested for dip buying. Some of the best gains seen were when the stock/index was getting hit then turned around. When applying the filter to stick out of the under-performance results, those big gainers would not have triggered. Thanks for the updates and looking forward to some further posts. That is exactly the problem with filtering. We’ll see if the results bear this out.